According to the organization research, the demand for black gold outpaced supply by 0.9 million barrels per day in the fourth quarter of 2017. According to the cartel’s forecast, world oil consumption in the first quarter of this year will amount to 97.2 million barrels per day. Decrease in demand compared to the fourth quarter of 2017 may result in a supply glut. For example, if the volume of production in OPEC does not change, then it can be equal to 0.6 million barrels per day. 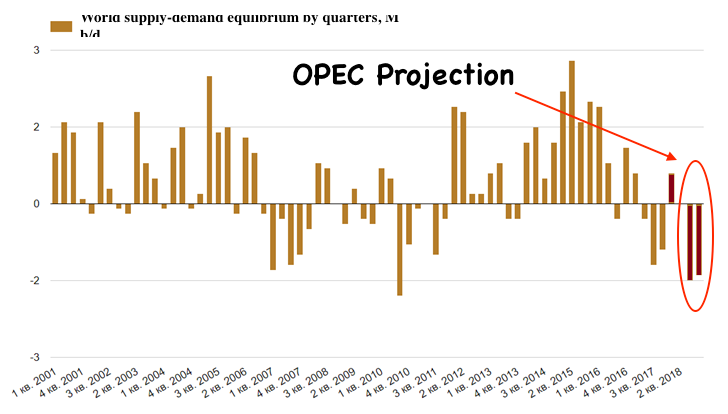 OPEC also adjusted its forecast for the shortage in the second and third quarters. If earlier it was equal to 0.4 and 1.1 million barrels per day, respectively, according to new projections it is 0.3 and 1.2 million barrels. Balance of the oil market by quarters, M b/d. However, an oversupply can return in the markets only during January to March. Further demand will level with supply, and by the end of the year the world may go to another extreme, facing a deficit of 1.4-1.5 million barrels per day. Sustainable output gains has been recently observed in the US while production increase in other parts of the world remain essentially muted. OPEC + froze production while Mexico, Brazil, Norway are lukewarm to pursue larger market share. Stabilized production is also the case for China. While there is forecast that the US will supply additionally about 700K barrels on the market in 2018, if you look at an average for the year, then possible supply increment is 1 million barrels. While the average world demand will increase by 1.5 million. That is, there are no particular reason to belief heavy market oversaturation can return to the market. 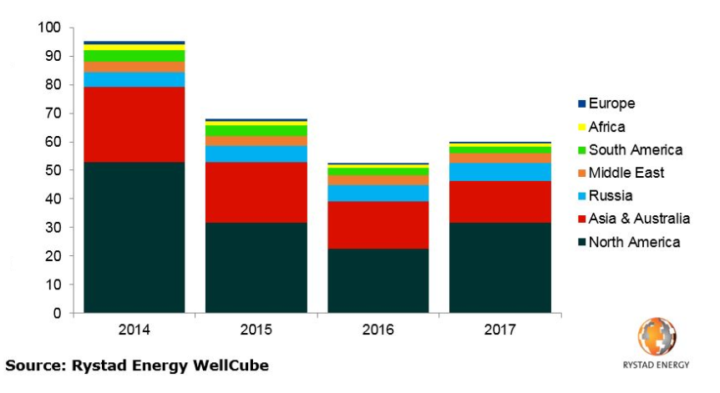 There was also a turning point in the opinion of analytical firm Rystad Energy – the number of drilled wells has recently risen. About 60,000 new wells were drilled and prepared in 2017 around the world, according to the agency estimate. Compared to 2016, the reading rose by 14%, which indicates a turning point in the reduction of drilling. The agency believes that the global demand for new wells will grow until 2020. The US shale industry has become the main driver of drilling growth. In 2017, in the United States, the total number of newly drilled wells increased by 40% compared to 2016. This trend will continue, suggest in Rystad Energy – the average annual growth will be about 11%. In addition to the US, Asia, Australia and Russia make a significant contribution to drilling, providing 88% of the total increment. America will remain the leading place in the world for drilling. Russia will follow it by the volume of activity, but the Asian region will show a decline.